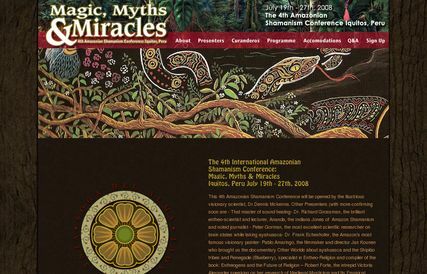 This 4th Amazonian Shamanism Conference will be opened by the illustrious visionary scientist, Dr.Dennis Mckenna. Other Presenters (with more confirming soon are – That master of sound healing- Dr. Richard Grossman, the brilliant entheo-scientist and lecturer, Ananda, the Indiana Jones of Amazon Shamanism and noted journalist – Peter Gorman, the most excellent scientfic researcher on brain states while taking ayahuasca- Dr. Frank Echenhofer, the Amazon’s most famous visionary painter- Pablo Amaringo, the filmmaker and director Jan Kounen who brought us the documentary Other Worlds about ayahuasca and the Shipibo tribes and Renegade (Blueberry), specialist in Entheo-Religion and compiler of the book: Entheogens and the Future of Religion – Robert Forte, the intrepid Victoria Alexander speaking on her research of Medieval Mysticism and Its Empirical Kinship to Ayahuasca, the very profound Melvin Morse (invited but not yet confirmed) and his research into childrens near death experiences as well as his research on Myths, the renowned Dr. John Alexander (invited but not yet confirmed) and his years of training and research on Remote Viewing, one of the Director’s of Eagle’s Wing and author Howard G Charing, Conference Organizer Alan Shoemaker speaking on 15 years in shamanism, the visionary artists Robert Venosa and Martina Hoffman two curanderas specializing in Huachuma (San Pedro) Wendy Luckey and Mary Ann Endowes Presenting as well as holding ceremonies, Elisa Vargas Fernandez, the Shipibo curandera who works magic with her incredible icaros, and many more to be confirmed.The list of shamans (curanderos) is coming next and they are the most powerful we can find. There will be approximately 15 different curanderos/shamans giving presentations (all are translated into English).During the Conference Presentations you will have ample opportunities to hear the many shamans speaking alone as well as in panel discussions. It is during this time that you will get a sense of which healer you would like to be in Ceremony with, especially during the question and answer times. There are three evenings set aside for you to be in Ceremony with the shaman – curandero or your choice. All Ceremonies are held outside of Iquitos, either up or downriver or way out on the Iquitos to Nauta highway and then a short 15 minute walk into the various Compounds. Transport is provided both to the location and returning to Iquitos the following morning. For those that have never been in Ceremony before, a workshop will be held by Dr. Richard Grossman and Alan Shoemaker so that all of your questions can be adequately answered. The Ceremonies offered are completely voluntary and not in any way a prerequisite of attending the Conference. Pre-Conference Tune-Up. Those wishing a program for a week before the Conference can come to the Pre-Conference Tune-Up. This is for more experienced Ceremonial persons. It begins one week before the Conference and will be held at the Soga Del Alma compound just outside of Iquitos. You will be able to make your own medicina and hold your own Ceremony without a curandero being present. Total price: $200 USDs This includes everything from the time you arrive at the maloca/compound.